Have a great week!! Oh and details on the Beat the Heat crop will be posted on June 10th so stay tuned! I just uploaded Scrap Camp pictures to my Facebook page. We had a total blast at the first ever Scrap Camp! A huge thank you to all that attended the first camp. I can't remember the last time I laughed so darn hard or got so many pages done. Here's a couple of pictures so you can see all the fun we had. Those brave enough or perhaps stupid enough to do the Zip Line! Sam and ALL the pages she completed while at camp! You go girl! No worries, there are several more scrap camps in the works. Just make sure you are signed up for the newsletter so you'll get all the information when it's available! I'm so excited, I've finally gotten the new Project Kit designed, cut, packed and ready to ship! 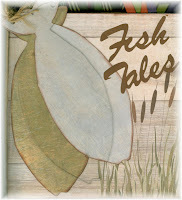 Check it out, our brand new 8 x 8 Fish Tales Board Book. All 10 pages are decorated with tons of photo mats and embellishments including some fun new embellishments using some fun fishing supplies! This hard bound book is a great way to capture those fun memories of fishing with the kiddos or hubbies favorite pastime. Novi, Michigan show this coming weekend, May 7-9th.